I just have to brag. Spent 8 hours in the kitchen yesterday, well one of those hours running to grocery store for heavy cream and butter. Cooked ALL DAY. It was glorious. Last week was so busy, busting out three more collages for an upcoming show, that I just didn't have time to cook and tried to rely on ready-made stuff. Bad move. Canned soups just aren't great. Frozen burritos with jarred cheese sauce is horrid. I didn't like the taste, and my stomach was not having it. So Saturday, after meeting my art deadline and delivering the work to the Carter Art Center Gallery in KC, I shopped. Hit one of my favorites, World Market. Some real deals. 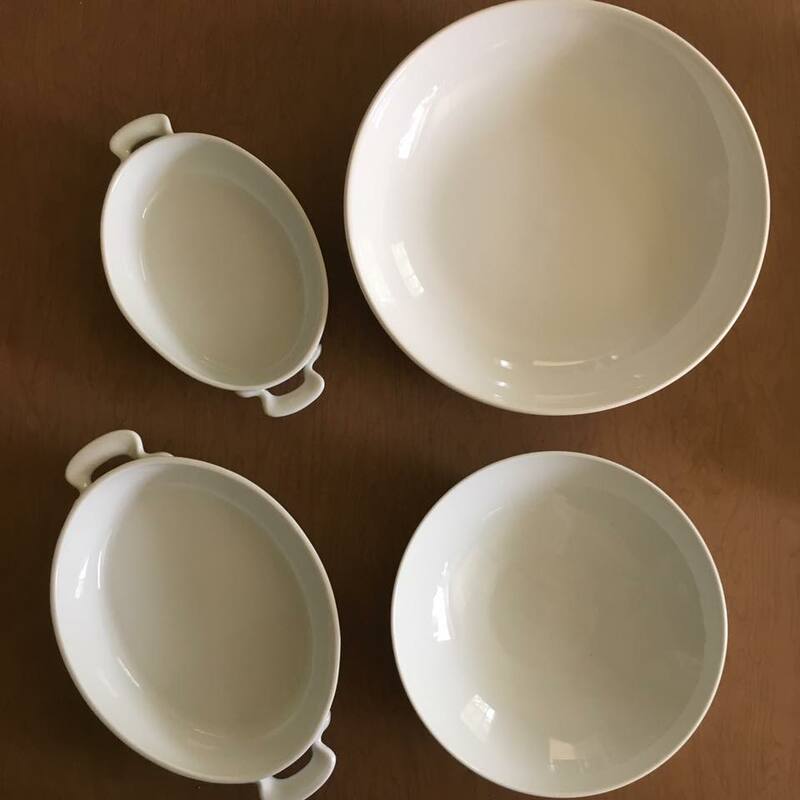 Got these large serving bowls and casserole dishes; not a one was over 12.99. Then went to Trader Joe's. Got some organic fruits and veggies, and fresh herbs. Then it was time to head home, sleep in, wake up and COOK. Spent the first hour or so slowly enjoying my coffee and pulling out ingredients, laying them all over the counters near my cutting boards. Getting various mixing bowls and utensils. Mise en place. Putting into place. Thinking through the order of the cooking. What needed oven, what needed stove top, which recipe was more high maintenance, more steps. Oh, and I had already chosen dishes and had purchased most of the needed groceries the day before at Trader Joe's. SO, started with the most involved one first. 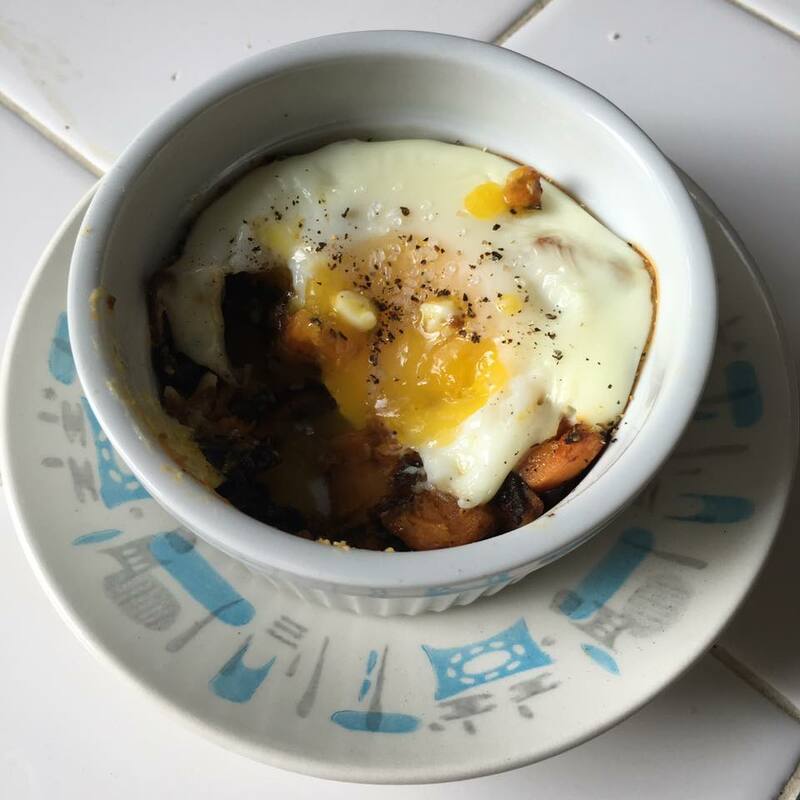 Caramelized onion and sweet potato hash with a baked egg. Recipe from The Kitchn cookbook. Caramelizing the onions takes at least 30 minutes of stirring and attention. Roasting the sweet potatoes takes about 30 minutes, too. Then you combine those into this cute ramekin, crack an egg on top, and bake for about 20 more minutes. Long time for little dish. But so worth it. Layers of yummy. I was so hungry I had taken a bite before I remembered the photo! Lesson learned...spray the ramekin. Egg stuck to the sides. Boo. Now I was nourished and ready to plod on! Next came two stove top dishes, meant to be lunches throughout my week. 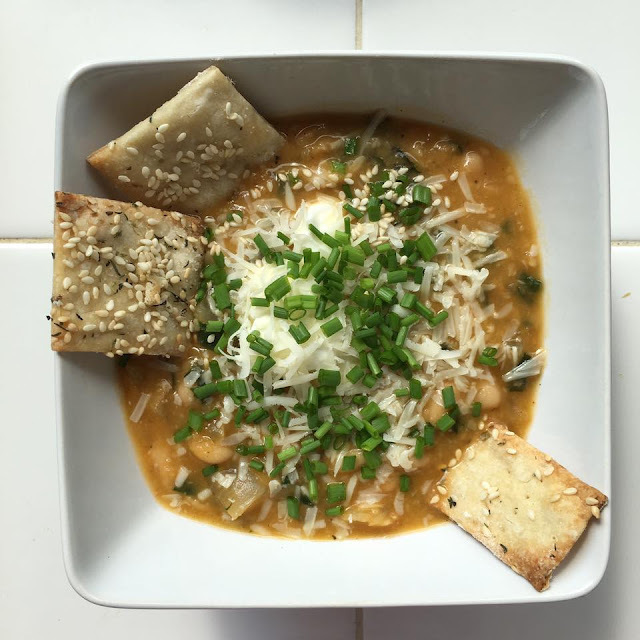 This white bean soup was a recipe from Real Simple magazine. Veggie stock, onions, two cans white beans, chopped fresh spinach, basil, salt and pepper. I think I threw in a bit of cumin. It's fun to season and taste, season and taste. But slowly. I've killed dishes with too much salt. Inserted the immersion blender and blended to my desired consistency, which is about a medium smoothness factor. I still like to know they are beans. Topped with a dab of plain yogurt, freshly shaved parm, and chopped chives. Served with homemade crackers. Prepared the soup in a regular saucepan. The next recipe I prepared in my purple le creuset dutch oven on the stove top first, then moved to the oven. It's just served and photographed in the pretty new casserole dish. 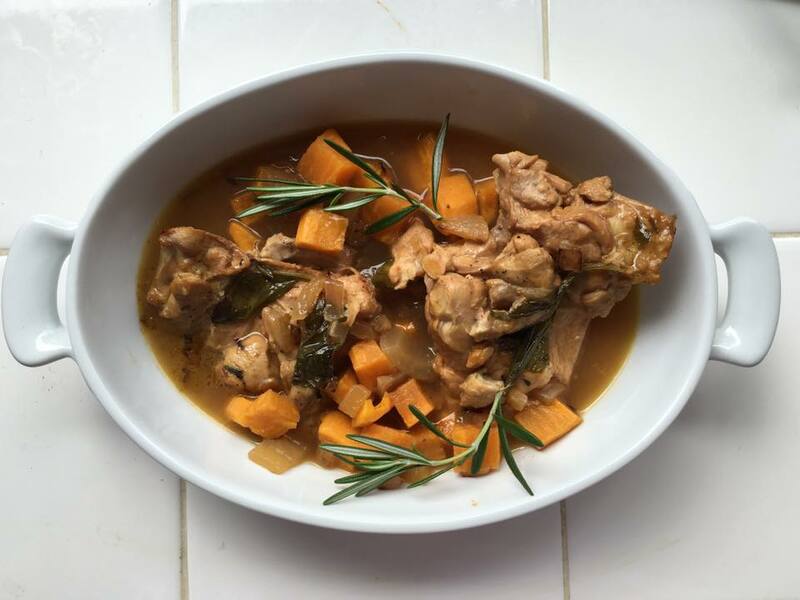 This is rosemary lemon chicken. No recipe in particular. It's a slow cooked flavor fest. Saute onions and garlic in butter. Throw in chopped peeled sweet potatoes. Salt and pepper. Lay on four salted peppered skinless boneless chicken thighs. Chop a lemon into fourths. squeeze onto chicken. Tuck lemon peels, full leaf basil, and three sprigs rosemary in and around chicken. Cover whole mess with chicken stock. Bring to a boil. Transfer dutch oven to the oven. Cook at 425 for about 45 minutes. Chicken should be falling apart and potatoes super soft. Take out rosemary sprigs before serving. 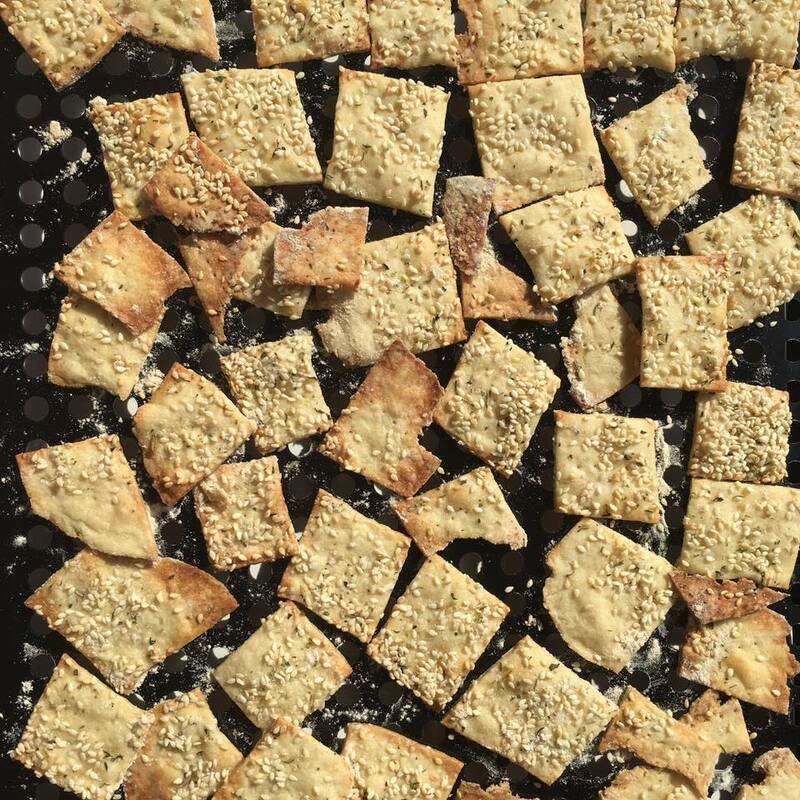 So while those two dishes were simmering away, I prepared dough for my first experience making homemade crackers. They are so cheap in the store, why bother, right? WRONG. Fresh. No preservatives. No weird aftertaste. Endless possibilities for variety using different types of flours and seasoning. This recipe was from The Kitchn cookbook. It called for poppyseeds and fennel seeds in addition to the sesame seeds I had on hand. But I just used the sesame seeds. It was easy to make the dough. I had to seriously concentrate on directions, because baking is not my thing yet. I'm clunky rolling out dough, knowing how much to flour every service and utensil so I don't end up a stick mess. Well it worked, and it was a LOT of work, cutting the crackers, picking up one at a time with a spatula, spacing them out on the floured baking sheet, piercing ever single one with a fork so they wouldn't puff up. Whew. But fun! I will do this again but only in huge batches. So I'm done with the oven and turn it off until I'm ready for the two final dishes of the day. Well, I have the next one prepared, turned the oven on, and it won't light. What the FRACK! This happened a few weeks ago, in the heat of the summer, and had a guy come fix it. In five years it never NOT worked. Well, here it is, the first time using it after it was fixed, and it won't work again. Toaster oven to the rescue! Seriously! The following two baked items were made in small batches in my toaster oven. Since I can only eat small portions and I was just experimenting, this worked well. For a dinner party, forget about it. The stove guy will come back soon, but I'm not paying! So this next dish just sounded like a tasty appetizer I wanted to try. Easy for a party. Recipe from Oprah magazine. They called it a rugelach. I looked this up, and merriam webster says it's a pastry made with cream-cheese dough that is rolled around a filling (as nuts, jam or chocolate) and baked. Well, this recipe was savory (my favorite) and called for pie crust dough. Hmm. Whatever it is it's GLORIOUS. 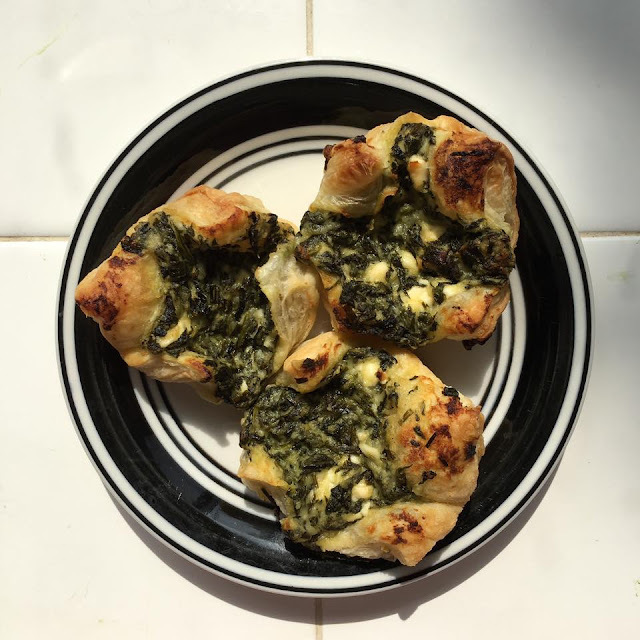 I had only used puff pastry once before, in a baklava, so I thought I'd like that kind of bread better than store-bought pie crust. The filling is cooked mixture of fresh chopped spinach, onions, garlic, lemon juice, and feta. I cut the puff pastry into squares and put a dollop of the filling in the middle, and attempted a kind of fold that didn't really work well but passes. I have lots to learn. 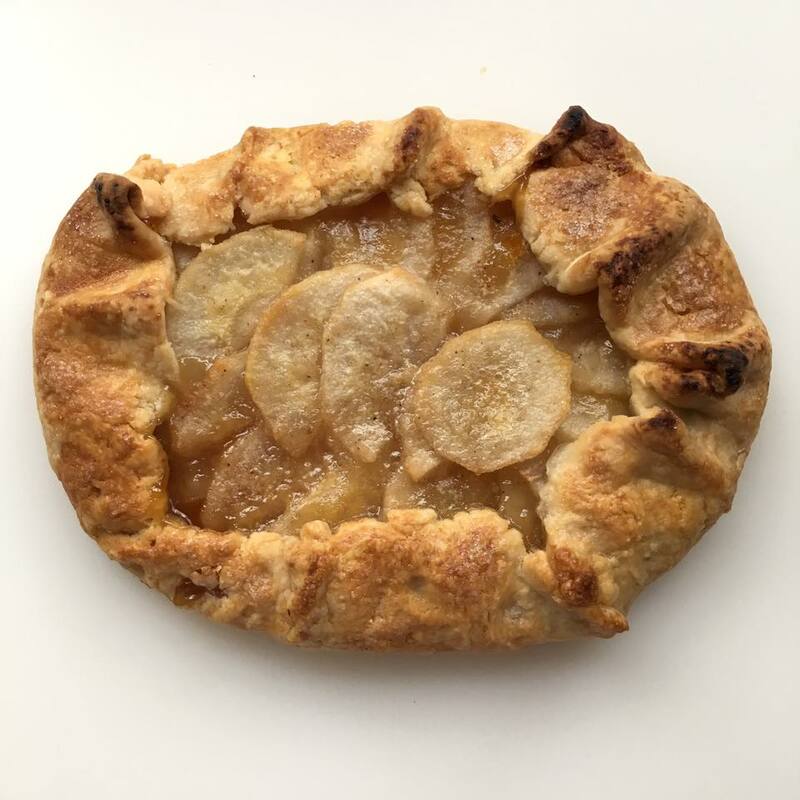 So last but DEFINITELY not least is this organic pear galette. Now, I'm not fond of desserts. At all. Weird, I know. But I want to have a couple of solid desserts up my sleeve for dinners and parties. This recipe is from The Kitchn cookbook. What's super is that you can use any seasonal fruit and complimentary seasonings. I'm not a big apple lover, but I saw some gorgeous organic pears and went for it. First I prepared the homemade dough. This was not hard! Yay! Just some pulsing of flour and butter and ice cold water added a bit at a time in my mini food processor. Again, I had to bake this in the toaster oven, so I didn't need to prepare much dough. You don't even need this dough, just pat it down into a disk and refrigerate for about 30 minutes. Meanwhile, I peeled the pears and sliced them on a mandolin and coated them with sugar, cream, flour and butter and a bit of cinnamon. Rolled out the dough. Spread some apricot preserves around the center, leaving about a two inch border of dough. Layered on the pear slices as pretty as I could muster. Then folded and crinkled the edges onto the top of the fruit. Put a few dabs of butter onto the exposed fruit. Brushed the crust with some water and sprinkled sugar. Baked. There you have it. Topped with whipped cream. Made it myself. Cup of heavy whipping cream into a chilled metal bowl. Add two teaspoons sugar, a teaspoon of vanilla extract, and whisk the hell out of it. Perfect! Tastes so fresh! Galette: a flat round cake of pastry often topped with fruit; a food prepared and served in the shape of a flat round cake.